To begin, open the Facebook app on your mobile device. Tap the for the “Hamburger”/”Three Bars” icon in the corner to show the navigation menu. Click “Settings and Privacy” to show a longer list of options, then click the “Settings” Item. Scroll down to the 2nd section called “Security”, then click “Apps and Websites”. Tap the option that says “Logged In with Facebook”. The screen that follows is a comprehensive list of all apps that have permission to access your facebook data. 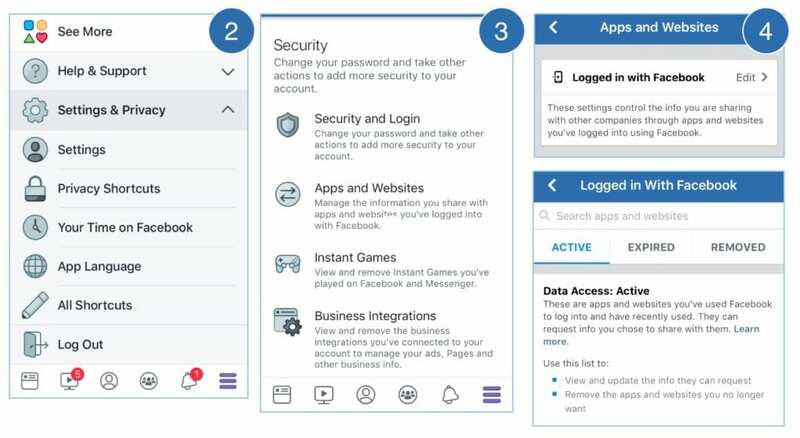 Apps with the “Active” status can currently access your Facebook data. Apps with the “Expired” status can access to any of your information that was acquired while the app was active, but cannot access your data at the time of this check. Apps with the “Removed” status cannot access your information.